Usha is an Indian home appliance manufacturer. One of their most popular appliances is their range of Tower Fans. Usha tower fans are one of the best ways to keep cool in the summer and are great alternatives to AC's thanks to their powerful air circulation abilities. 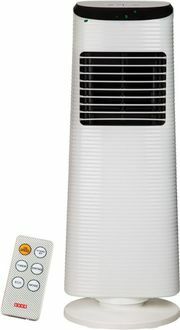 Usha tower fans can be used at home or in an office to circulate air. They are ideally placed on the floor, and thanks to their sleek nature, they can fit into corners or narrow spots unlike other fans in the market. Usha tower fans also function quietly so it's easy to forget there is an Usha tower fan in the room. Usha tower fans are tall and slim and come in modest colors like black and white that can easily be matched with home decor. 3 popular Usha tower fans are displayed in the Usha tower fans price list at the lowest price in India. Usha tower fans price list is kept up-to-date with the latest Usha tower fans price from sellers across cities in India. Usha tower fans prices were last updated on 25th April 2019. Bajaj wall fan prices in this Bajaj wall fans price list are best used in the cities of Mumbai, Chennai, Pune, Kolkata, Hyderabad, Bangalore, and Delhi. Bajaj wall fan prices may vary in accordance with taxes applicable in other towns and cities.